Thank you for four amazing years, Tenno! 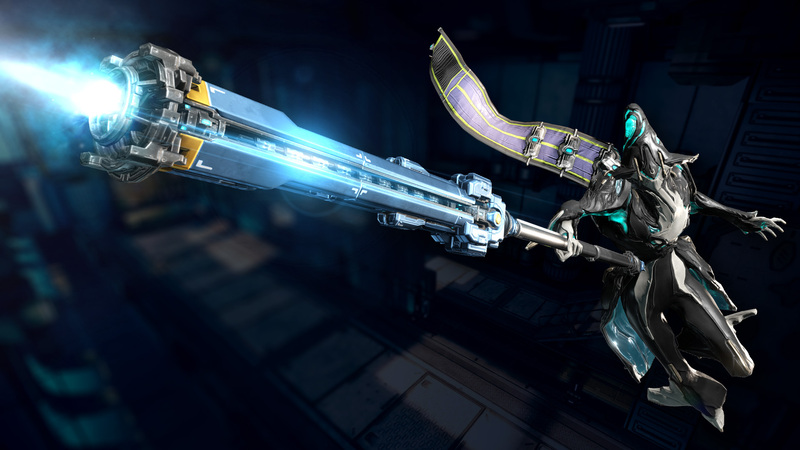 As our thanks to you, we’ve got the Dex Nouchali Syandana coming to your inbox on March 28! Until then, from March 24 to March 27 gear up for Sortie-styled Tactical Alerts where you can fight to salvage and claim our previous anniversary gifts! The following Tactical Alerts will be presented via a Sortie-like mission screen on the World State Window. Completing the first mission will unlock the following challenges in order. · Dex Nouchali Syandana becomes available. · Awarded via in-game inbox upon login. · You are not required to complete any of the previous alerts to receive the fourth year anniversary item. You only have one week to claim the Dex Nouchali Syandana so make sure you login within the time noted above! The Infestation has overrun a convoy of allied ships and forced the surviving crew into emergency safe rooms. They’re holding on for now, but without your support, they’ll die on those ships. Before you go, you should know something; the crew is Grineer. But not just any Grineer, they’re Kavor Defectors, pacifists who deserted Sargas Ruks army when they could no longer bring themselves to kill for him. They don’t want to fight anymore, not for the Grineer, and not for Steel Meridian. All they desire is a peaceful life, but that won’t come easy; Sargas Ruk is hot on their trail and desperate to make an example of them. The Kavor need evacuation, will you answer this call? Many, many months ago we showed our community something we nicknamed ‘baby’s first Sentinel’. This quirky looking Sentinel has arrived, and it serves a very clear purpose: provide new players with an introduction to the Companion System. 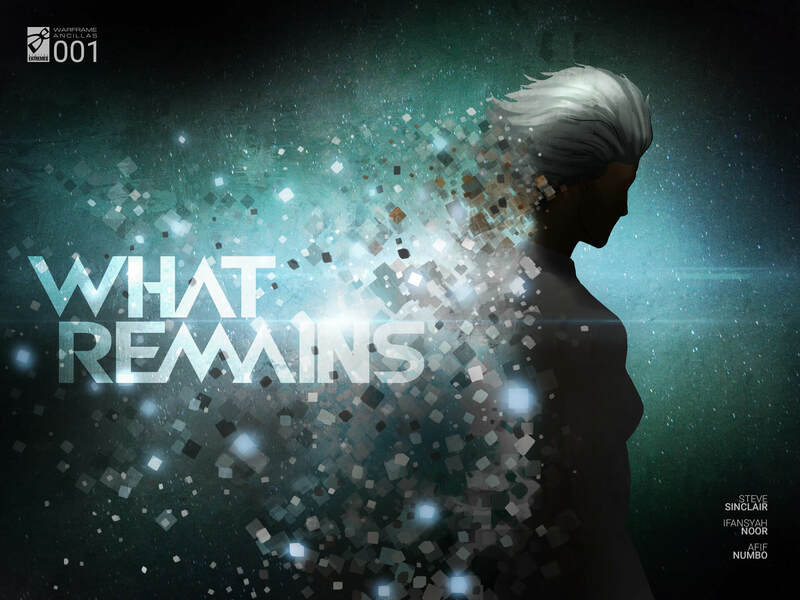 New player experience is always on our mind as Developers. This new Sentinel joining your Arsenal has that exact new-player approach to it’s functionality and mechanics. Say hello to TAXON! Perhaps Taxon will not replace the Mastery Rank 23 player’s beloved Carrier, but please keep in mind that it was created and geared towards new-players who are experiencing Warframe for the first time. A new Sentinel has been discovered that is programmed to assist newly-awoken Tenno. With ‘Retarget’ and ‘Molecular Conversion’ as its default Precepts, Taxon protects its owner with shield restoration. 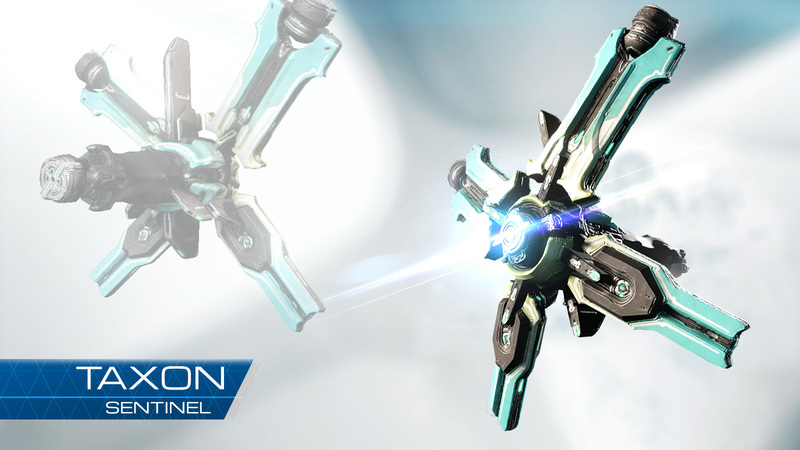 Taxon comes equipped with the Artax Sentinel Weapon! Freeze targets in their tracks with this Sentinel mounted ice-beam. Visit the Market or the Energy Lab in your Dojo to start the Ferrox research now! • March through the battlefield with this Corpus cloak. • A collection of glyphs, using captured frames from the 100 Days of Warframe video by Digital Extremes & MASHED. Foundry items can now be cancelled while in the ‘Build’ stage, and all resources (except Argon) will be refunded back to you instantly! This is done by clicking the red ‘X’ on the item itself in the Foundry Screen. You no longer need to make a Support Ticket to undo an accidental crafting – you have the power now! Community Made Skins for the following Items have been added to the Market! 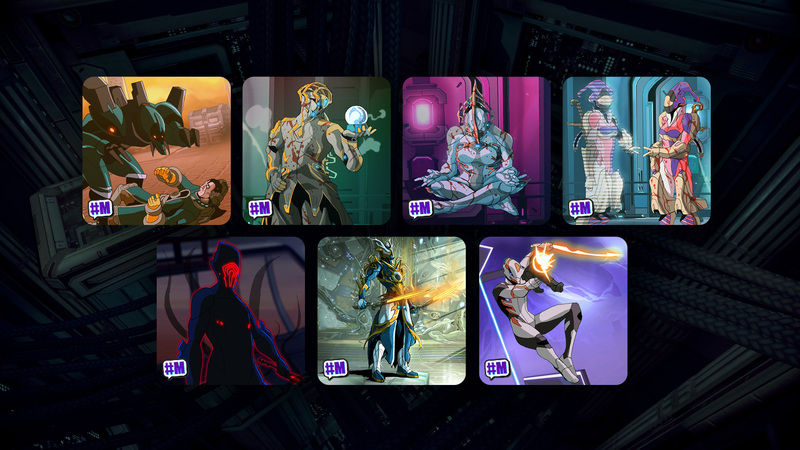 Check them out and support your fellow Tenno! 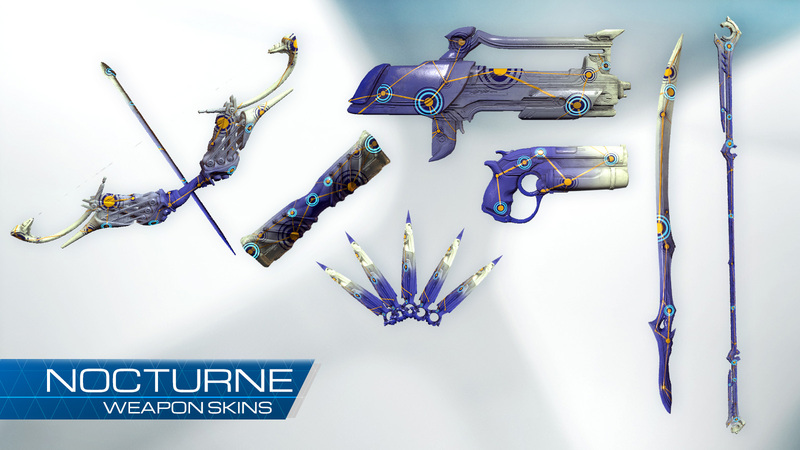 A collection of skins forged by the Grineer’s leading weapon manufacturer. Cobbled together from vanquished Grineer, this Steel Meridian armor sends a clear message to the enemy. • Shooting enemies in the head versus their gut is very useful when it comes to…everyday Tenno life. To better indicate exactly where your bullets are penetrating, hit indicators will be a pulsing yellow on default (anywhere but the head) and a quicker pulsing red when administering those satisfying headshots! • Added text help explaining how to drop the bomb once you’ve picked it up to help alleviate confusion on this mechanic. • The vent objective markers are now hidden when there’s a bomb that’s not being carried to give a more clear priority of when they need to be interacted with. • Bursa spawning is now disabled for the duration of the mission (was previously duration of boss fight). This fixes Bursas following you into the boss fight after triggering the alarm before initiating the boss fight. • Fixed music changing randomly throughout the boss fight. • ‘Weapon Only’ Sorties will now auto-unequip disallowed weapon types when loading into the mission instead of having to visit the Arsenal and manually change your loadout before initiating. • Removed the Mastery Rank based limit to how many Riven Mods you can have. • The Earth tileset in Vor’s Prize has received a lighting adjustment. • Removed spawnable Kuva, Sentries, Turrets and Cameras in the Simulacrum. • Hydroid’s Tempest Barrage can now be cast while moving and on ziplines. • Waypoints now show total distance to waypoint instead of its own distance from the player. • Reduced the size of the Excavation Power Cell marker. • Increased the first swing animation speed for the Sovereign Outcast Tonfa Stance Mod. • Minor performance improvement to shadow casting lights. • More optimization to improve Relay/Dojo performance. • The Braton, Lato, Paris, Kunai, Skana and Bo (and their MK1/Ak versions) have all received a refreshed look! These starter weapons are the first tools new player’s see, yet they’ve been using models and textures that are almost half a decade old! 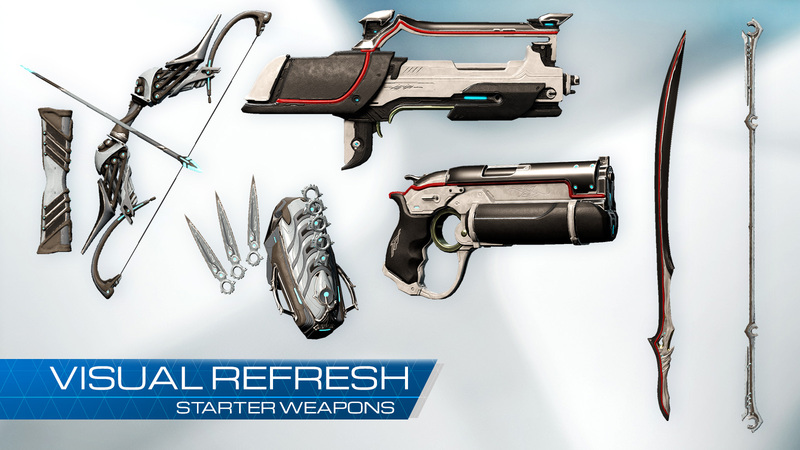 We have refreshed these weapons to look much higher quality for starting weapons. Please note that all pre-existing skins for the Braton (Day of the Dead, Forest, Conclave) will appear to use the ‘legacy’ version of the weapon. • The Braton, Lato, and Paris have also received newly remastered sounds as a major change to the way weapon firing sounds work. These remastered sound changes will come in a future update for their Prime versions. • Removed a vaulted Relic from the Daily Tribute rewards and replaced with new Relic. • Removed a vaulted Relic from high level Spy mission rewards and replaced with new Relic. • If you do not have a Scanner equipped, scannable plants/objects will display a ‘requires Codex Scanner’ to give players hints on how to interact with various environment objects. • You can now access Chat while Ash is performing his Bladestorm. • Removed a non-functional ‘Skill’ Statistic from Player Profiles. For too long we’ve questioned what this meant, and it’s finally gone. • Removed erroneous hyphen from Broken-War, it will now forever be just Broken War. • Removed Convergence orbs from appearing in Mastery Rank tests. • Reduced the firing sound of the Artex Sentinel weapon. • Tweaked phrasing of Blueprint uses to alleviate some confusion (most noticeable for Specter Blueprints). • You can now apply Default Warframe skins on Prime Warframes! 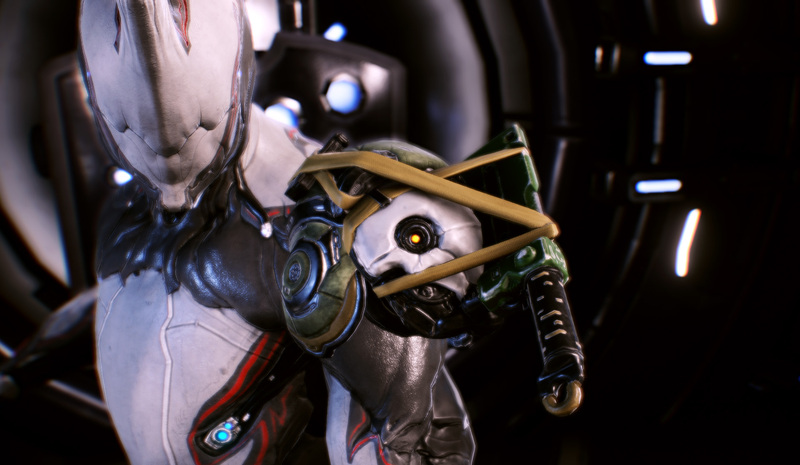 • There is now a ‘Toggle Prime Details’ toggle for TennoGen skins once applied to a Prime Warframe. This allows you to choose between the Prime Warframe mesh or the Default Warframe mesh! • The Relic Reward selection screen now displays your ‘Owned’ count per Relic. • Improved spot-loading issues when attempting to trade. • Further minor firing sound improvement tweaks to the Braton, Lato and Paris. 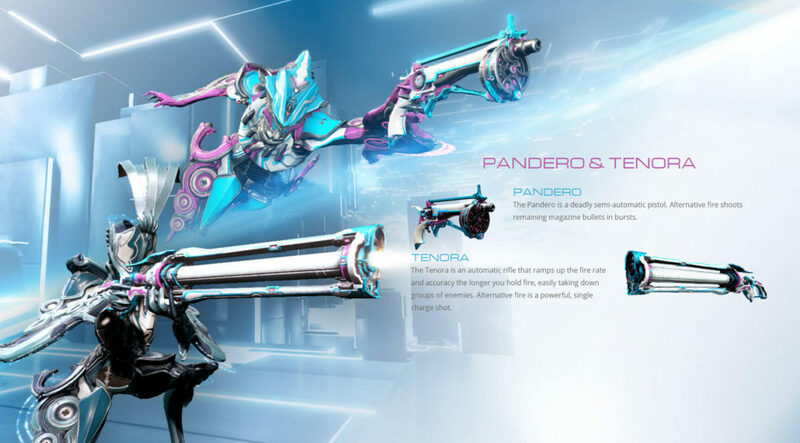 • The Arcturus Syandana will now fade out when aiming down sights to help visibility when playing from the right hand side. • Replaced an idle NPC with a Steel Meridian NPC in the Steel Meridian Relay room. Get out of here default scrub! • Improved visibility of previewing Sugatras on large weapons in Market dioramas. • Rhino’s Roar buff HUD indicator now displays added damage buff amount (it shows up briefly up top just like Trinity’s Blessing %). • More enemies will now spawn in addition to the required kills needed to complete the mission. Once you have met your mission’s objective, the remaining enemies will have their morales broken and will flee! You are free to extract any time after you’ve finished the required enemy count. • The required kill-count for densely overpopulated Exterminate missions has been slightly reduced, but is still high in relation to the number of enemies. • Lagging enemies will now appear closer towards the extraction location. • Syndicate NPCs will now always attempt to take cover between you and the exit in Syndicate Exterminate missions. • Ignis flame FX and the transition of Ignis’ flame particles fading on ceasefire has been visually improved! • Javlok’s projectile collision size has been increased, making it easier to land hits while also dealing 50 Heat AoE damage in a 1.6m radius. • Improved the performance of Oberon’s Reckoning ability. • Improved performance related to explosion damage. • Tweaked the last stage of The Archwing quest to include a UI objective text. • The extraction marker in Survival and Excavation will now show up in-world for 60 seconds and then switch to minimap only, so if you do mean to extract you can follow it, if you don’t then after a minute it will stop annoying you. • Sentients will only alert team-mates and not set level-wide alert status when engaging targets. • Removed Ayatan Stars and Nav Coordinates from lockers and crates in Vor’s Prize to pace out the number of new objects encountered near the start of the game. • Various visual tweaks to Banshee’s Sound Quake to address feedback. • Improved visibility during Nyx’s Absorb ability. • Banshee’s Sound Quake range FX will now only appear for the local player due to epileptic precautions and reports. • Improved volume of the new firing sounds introduced in Update 19.19.0 in different environments for the Braton, Braton MK1, Lato, and Paris. • Mirage’s Eclipse ability will now show a HUD buff icon when active. • “Use Zip Line” context action is now attached to and scales with the cable you wish to use. • The Codex now states if an item can be found as a Syndicate Offerings or Relic Pack, and if it can be found through Transmutation. • Tweaked the cache HUD text during Hive missions to better display priority. • Replaced the Ash Prime Neuroptics Blueprint with Ash Prime Systems Blueprint in the Neo N5 relic as intended. • Mobile Defense Terminal markers now blink to portray which Terminal is currently hacked and requires your expert guarding skills! • Flight Speed Mods can now be used on the Euphona Prime. • Deconstructor Prime can now be used on non-Prime Helios. • Optimized a frame-time spike that would occur in busy levels whenever you killed a power-cell carrier. • Improved the visibility of the flowers near the bottom of the Bodo Syandana. • Reduced the volume of the Latron and Latron Prime 3D firing sounds. • Ivara’s Prowl now displays a loot % stat in the Arsenal when viewing Ability details. • Improved performance of the Simulor. • Changed formatting of ‘MUTALIST’ names to avoid using a dash. • Enemies that have been targeted for Inaros’ Devour are now invulnerable to everything but you while they are being pulled in. • Increased the amount of the Ferrox pull force to prevent enemies from meleeing out of the tether. • Improved enemy navigation paths in the Infested Salvage game mode. • Those that have been trade-banned or are below the minimum Mastery Rank for trading can now enter Maroo’s Bazaar to trade Ayatan for Endo from Maroo, but trading with other players in the Bazaar will not be accessible. • You can now sort your Relics by Name, Refinement, and Owned! • Rhino no longer has a Mastery Rank requirement! Previous to this change, Rhino required a Mastery Rank of 2 to use. Since Rhino is the first Warframe accessible by boss drops, we have removed the Mastery Rank to improve the new player experience. 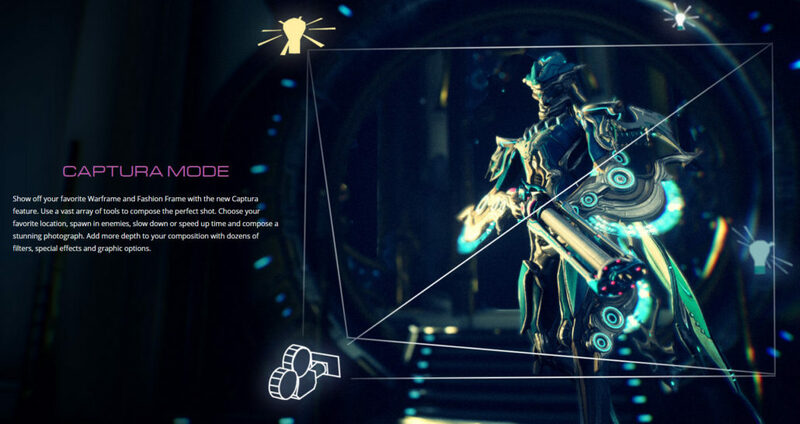 • Replaced Orokin Cell with Gallium, and replaced Neural Sensors with Morphics as a crafting requirement in the Rhino Blueprint. This is also in the interest of using Rare Resources found on earlier planets to allow for Rhino to be crafted earlier on! • Maroo can now be interrupted if you want to progress the conversation in her Bazaar! • Oberon’s Beastmaster Passive no longer works on hostile Kavats in the Sands of Inaros quest. Sadly these Kavats must hate you and they must die. • Mesa’s Peacemaker ability now ignores all invulnerable enemies. 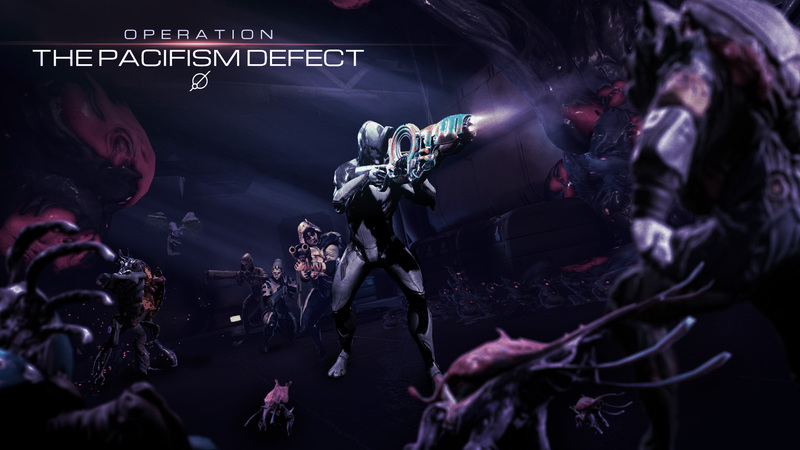 • Rifle Amp and Shotgun Amp Auras now apply to Titania’s Dex Pixia weapons. • Lost or stolen weapons now visibly appear through walls to the player who owns it. • Assassination nodes will permanently display the respective Boss portrait when hovering over the node. • Moved the ‘Miscellaneous’ Inventory category to the end of the selection line. • Made improvements towards performance in the Relays. • Made improvements towards loading Landing Crafts with a plethora of Noggles (cough cough Reb…). • Updated Stance Mod descriptions to read “Stance:” rather than “STANCE -“. • Shifted the Officium Syandana to better sit on Warframes based on creator feedback. • Fortress Scanner alarms will no longer play for the entire duration of security detection, instead will play only when initially detected. • Tweaked numerous Mod Upgrade UI components to add icons and remove redundancies. • Tweaked the Grineer AI behavior in Vor’s Prize to be a bit more aggressive when it comes to letting you escape in the Liset. • Tweaked the Mastery Rank Up text to be Title Case instead of all UPPERCASE. • Toned down the slowed Cold FX on enemies due to excessive Bloom. • Removed Hyena Pack and The Raptor from the Simulacrum. • Removed Kavor Defectors from the Simulacrum. • Removed the UI sound for Objective markers. • Added a sound when switching modes between normal and Variant/practice. • Fixed being killed with 1 health left in Conclave. Considering you weren’t actually dead, no Oro was given to the enemy perpetrator which was causing confusion. • Fixed Sonicor not causing knock down in Conclave. • Fixed Ash’s Bladestorm not marking targets when Heightened Reflexes is equipped in Conclave. • Reduced the primary fire damage of the Javlok in Conclave. • Fixed the Anasa Ayatan Sculpture not being moveable after placing it in the Landing Craft. • Fixed Endless Void Fissure reward screen always showing you the Relic you cracked as your every-five-rounds bonus Relic. You actually get a random Relic of the same tier (that may or may not be the type you cracked). • Fixed a case where if a Client Nidus Parasitic Links a teammate and leaves the game, the HUD buff icon may remain for said teammate. • Fixed Argon Scope, Hydraulic Crosshairs and Repeater Clip not using proper HUD buff icon. • Fixed Sortie reward element saying you’ve completed the current Sortie even if you haven’t finished it yet. • Fixed the Cryopod’s Health bar being greyed out while defending it in Asteroid Mobile Defense missions. • Fixed certain enemies being accessible in the Simulacrum (Chroma, Infested Mesa, etc) and secret-Codex entries being visible for certain enemies. • Fixed players stuck in Vor’s Prize without the Arsenal Segment. You will receive this Segment on login. • Fixed the Detron Mara having the name switched as Mara Detron. • Fixed Transports from Archwing Rush missing from the Codex. • Fixed unnecessary text spacing for Quaro items. • Fixed script error that could occur in Arsenal with Spira Prime equipped. • Fixed a script error with Chroma’s Effigy. • Fixed a script error when loading into the Uranus > Neptune Junction. • Fixed using Valkyr’s Hysteria/Excalibur’s Exalted Blade/Wukong’s Primal Fury during a ‘Weapon Only’ Sortie resulting in “Power In Use” when casting any ability for the remainder of the mission. • Fixed Ivara being left without a weapon after casting Artemis Bow during a ‘Bow Only’ Sortie. • Fixed Mesa’s Peacemaker not cooperating with ‘Weapon Only’ Sorties. • Fixed sometimes becoming permanently invincible when using Transference right when the wave ends in Defense missions. • Fixed floating in space without an Archwing in Fortress Sorties. • Fixed running animation being absurdly fast when skipping the fly-in cutscenes in the Relays. • Fixed a problem where a Relic reward choice would not be applied if no players qualified for a Relic reward in the subsequent reward interval in that mission. • Fixed Grineer Rollers getting stuck after attacking. • Fixed an issue with starting The Silver Grove quest from the World State Window. • Fixed some water in the Grineer Forest not playing splishy-splashy sounds when you prance through it. • Fixed Mag’s Polarize shrapnel limit not being applied correctly (would sometimes give you one less than the intended limit). • Fixed Lotus saying her “now kill everything that moves” line when she shouldn’t in Sabotage Sorties. • Fixed Glyph texture streaming in certain cases. • Fixed the minimap shrinking after clicking “Battle” in a Defense mission and having ‘Prefer Overlay Map’ enabled. • Fixed incorrectly placed Submersible entrances in the Grineer Sealab tileset. • Fixed a level hole players could leave level boundaries in the Grineer Settlement and Grineer Sealab tileset. • Fixed Phoenix Renewal (Regeneration Augment Mod) Impact message showing loc tag. • Fixed the ‘Can’t Sell’ UI tag appearing outside the box in certain languages. • Potential fix for Riven Mods not producing correct elemental priority for Clients. • Fixed a shadow discrepancy in the Grineer Shipyard tileset. • Fixed incorrect steam sounds playing in the Landing Craft. • Fixed Oberon’s Agile akimbo stance using the wrong animation. • Fixed Clients not being able to destroy nerves 2 and 3 in The Jordas Verdict stage 3. • Fixed initial objective markering not popping up in The Archwing quest. • Fixed The Archwing extraction during the Balor Formorian phase not initiating when playing in a squad. • Fixed first swing animation not playing for the Sovereign Outcast Tonfa Stance Mod. • Fixed a script error with the Panthera when using the primary fire immediately after stopping the secondary fire. • Fixed script errors with Exalted Blade/Hysteria/Primal Fury. • Fixed Clients gaining invulnerability when using Transference from Warframe to Operator. • Fixed menu automatically closing if you open it within a few seconds of landing in Relay. • Fixed scanner scopes showing weird HUD when used on Landing Craft. • Fixed objective markers in Lua Rescue directing you off into space. • Fixed not losing wagered Credits when losing a match in The Index Endurance. • Fixed Frohd Bek’s suit appearing as pure black during transmissions. • Fixing missing collision on rock walls in the Grineer Asteroid tileset. • Fixed Kuva Jesters standing on Kuva Guardian’s shoulders when shot with Ivara’s Sleep Arrow. • Fixed a rare case of players sometimes not unlocking the Focus system when completing The Second Dream, which resulted in progression stoppers during The War Within. • Fixed progression stopper in the Grineer Shipyard tileset caused by missing Mobile Defense consoles. • Fixed a script error when using the Sibear. • Fixed a script error when casting Rhino’s Rhino Charge. • Fixed script errors in Broken Scepter and Ivara Quiver with null avatar. • Fixed being able to complete the puzzle phase of The Law of Retribution by going in and out of Transference to occupy numerous pads. • Fixed Clients missing their Archwing weapons when spawning in water at the start of the Sortie mission. • Fixed Ivara’s arrows misbehaving after casting her Artemis Bow. • Potential fix for Clients with Hysteria/Exalted Blade/Primal Fury/Artemis Bow active and running into a Nullifier briefly causing complete ability/melee/weapon switch lockout on next cast. • Fixed Automatic weapon removal in ‘Weapon Only’ Sortie missions stripping players of their Submersible weapons on Uranus. • Fixed mismatched ships appearing in the fly-in cinematics for Clients. • Fixed rare script error in squad overlay when mission gets aborted due to Client not having proper items equipped in loadout. • Fixed Void Fissure Reactant pickups interrupting Melee animations. • Fixed the Proto Glaive Skin not working properly on any thrown Melee weapons and appearing blurry in the Arsenal. • Fixed enemies remaining hostile after being spotted during your first try of the Mastery Rank 9 test. • Fixed a level hole in the Grineer Sealab tileset. • Fixed massive performance issues on Kuva Fortress Defense when walking around and meleeing around the Defense Target. • Fixed certain finishers (e.g. Galatine back stab) teleporting the victim into strange spots (often out of bounds) after the finisher completes. • Fixed a case of players sliding/teleporting really far when performing a ground finisher on enemies (notably with the Redeemer). • Fixed the Helminth Infirmary chair not curing your Warframe of the Cyst. • Fixed Nidus’ Market Build tab stating his parts drop from the ‘Purify’ mission when it’s actually the ‘Infested Salvage’ mission. • Fixed inconsistent terminology and grammar in Maroo’s Bazaar and elsewhere. • Fixed a level hole in the Grineer Settlement tileset. • Fixed a script error that occurred in a Lua Spy Sortie mission. • Fixed Clients and new Host not being able to complete Lua Spy room puzzles if a Host migration occurred. • Fixed the Zarr’s mini projectiles not sticking to enemies when equipped with Adhesive Blast. • Fixed unintentional DOT from Adhesive Blast on the Ogris, Penta, Secura Penta, and Tonkor. • Fixed Ash continually performing Bladestorm finishers when attempting to melee after casting the ability as Client. • Fixed unintentionally being able to use Warframe Abilities in the Mastery Rank 19 Test. • Fixed failing the Mastery Rank 19 Test due to dead enemy bodies causing enemies to remain in an ‘alert’ state. • Fixed not being able to Revive when put into a downed state in a Mastery Rank Test. • Fixed the Atterax not returning to its holstered state after its first use. • Fixed Ivara’s Agile animation resetting to Default when a Bow is equipped. • Fixed the Daedalus Armor floating away from Nidus when equipped. 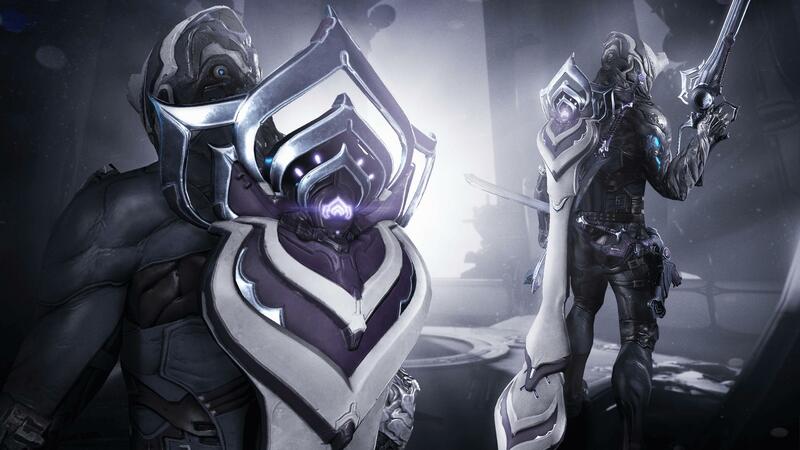 • Fixed Excalibur and Limbo having a duplicate skin to equip. • Fixed the Bow Dryad Skin not applying correctly to the Rakta Cernos. • Fixed missing FX on Vor’s Janus Key beam during Vor’s Prize. • Fixed Mag’s Noble and Agile animation stance breaking when equipping dual pistols. • Fixed level holes in numerous tilesets. • Fixed script error preventing Rathuum from functioning. • Fixed script error with Hydroid’s Undertow when absorbing a ragdolled enemy. • Fixed script error with Nyx’s Absorb ability FX. • Fixed script error when performing a finisher. • Fixed script error when attempting to trade. • Fixed script error that would occur when checking time left on an expired timer during Archwing Rush. • Fixed Orbiter drones not spawning after a Host migration occurred during Archwing Rush. • Fixed Secondary Riven negative Fire Rate affecting Primary Bow Fire Rate. • Fixed Nef Anyo not appearing as Sortie mastermind during Sortie transmissions (was showing The Sergeant instead). • Fixed numerous Braton variants not having a physical magazine. • Fixed the MK1-Braton not showing its clip after reload. • Fixed the Braton Prime not dropping its clip when using a skin with a clip. • Fixed being able to apply Operator Skin Tone colors to Warframes. • Fixed the Rathbone Head icon showing a Prime Blade image. • Fixed Sortie-Defense operative being labelled as “hostage” when tagging him with a waypoint. • Fixed “repeat mission” not working for Invasions, Void Fissures, and Dark Sectors. • Fixed improper capitalization of ‘Fill Airlock’ context action in a Grineer Sealab tileset. • Fixed Prisma Tetra reloading sounds cutting off. • Fixed Grineer Hellion’s not releasing a projectile upon being destroyed while active. • Fixed the Courier ship in Archwing Rush appearing warped and flat. • Fixed AI player names in The Index being localized in hosts language. • Fixed a script error when casting Mag’s Magnetize. • Fixed being invulnerable after the first round in The Index. • Fixed Health Orbs spawning below the ground in Rathuum. • Fix an issue that was preventing players from placing decorations in Dojo rooms that don’t yet have any decorations. • Fixed Vault doors in the Orokin Derelict throwing Clients out of bounds if they performed a roll and then shot their weapon before opening it (although why such rambunctious activities are necessary in a game this peaceful remains unclear). • Fixed shooting the buttons in the Jordas Trial when they are greyed out prevents players from shooting the buttons after being kicked out of the tunnel. • Fixed Oro Ornament displaying mesh when attempting to place it in an invalid spot in your Landing Craft. • Fixed an elevator panel clipping through a wall in the Corpus Gas City tileset. • Fixed being able to escape the level by traversing a zipline through a wall in the Corpus Outpost tileset. • Fixed launching into Submersible Archwing mode when not required, and breaking movement in the Grineer Sealab tileset. • Fixed an issue where having duplicate rooms or decorations would prevent you from entering your Dojo. • Fixed Holster customizations not applying to the Dark Split-Sword. • Fixed experiencing minor latency after making a purchase. • Fixed Lotus saying her ‘Well done, Tenno’ VO in wrong situations. • Fixed several Prime Part and Prime accessories not Chat linkable. • Fixed subtitle of Invasion selection screen breaking into two lines. • Fixed Lotus transmissions playing when spawning Lynx in the Simulacrum. • Fixed Synthesis Target Affinity being lost after a Host migration. • Fixed experiencing a hitch when bringing up the Codex after a Silver Grove mission. You’ll now see a “please wait” for up to several seconds depending on your Mod collection, similar to viewing the Codex immediately after logging in. • Fixed the Limbo Aureolus Helmet not functioning properly with his animations. You wanted the hat tip you got the hat tip! • Fixed the Arcturus Syandana floating when equipped on Loki Prime with a Default Loki Skin. • Fixed Smeeta’s Charm precept buff giving Bows an unintended insane Fire Rate. • Fixed the Grustrag Bolt Release Blueprint stating it has 1500 uses. • Fixed not being able to color customize the middle section of the Landing Craft floor. • Fixed an escapable level hole in the Grineer Galleon tileset. • Fixed a wonky rock texture in the Grineer Asteroid tileset. • Fixed unlocalized ‘Toggle Prime Details’ text. • Fixed Law of Retribution’s bombs taking longer to charge. • Fixed UI lockup when linking a Riven Mod while cycling. • Fixed Ash’s Bladestorm death FX not showing up for Clients. • Fixed the Rescue rooms on Lua not having an alarm for enemies to set off once you have become detected. • Fixed Mods with negative Accuracy not affecting the Cernos Prime’s spread. • Fixed the Synthesis Scanner counting as ‘next shot’ or ‘next hit’ for the purpose of some Warframe Abilities/Passives (Volt’s Static Passive, Mesa’s Ballistic Battery, etc). • Fixed equipping Zhuge showing incorrect weapon mesh and appearing blurry. • Fixed being able to infinitely move the Hijack object by using the Operator. • Fixed being unable to access Display and Audio options when the World State Window is open. • Fixed one of the Hidden Messages quest node being labeled “Solve the Riddle from the Inbox Message”, which defeats the purpose of the riddle. • Fixed Mirage’s Hall of Mirrors clones remaining permanently in the Mastery Rank 22 test if active at the end of a round. • Fixed doing a ‘Quick Melee’ resetting your custom holster position. • Fixed the Gammacor expanding when holstered and sprinting. • Fixed the Synoid Gammacor holster position appearing on the floor for Cephalon Suda operatives. • Fixed the Heliocor’s ring FX appearing while holstered in the Relay. • Fixed the Tonkor’s iron sights not being flipped up when first loading into a mission. • Fixed some units in Codex dioramas clipping into the floor. • Fixed the Jackal being too large and in charge in his Codex diorama. • Fixed the freeze FX on the Corpus Ice Planet only applying to the Operator’s head. 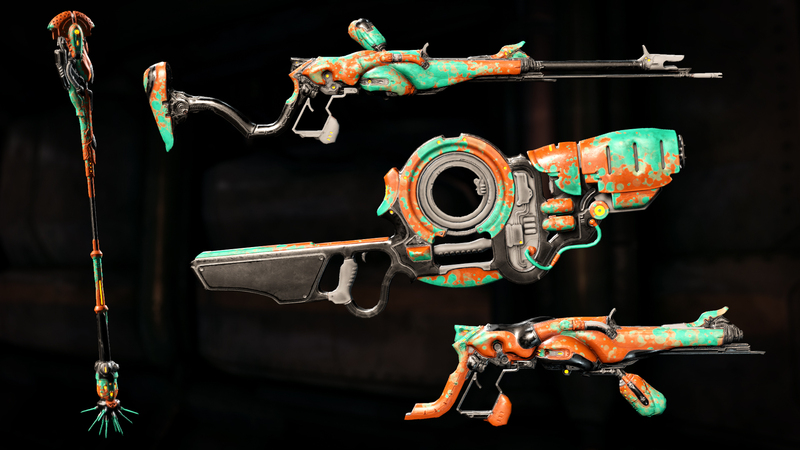 • Fixed the Prisma Dual Cleavers keeping prisma textures when equipping deluxe weapon skins. • Fixed screen blur & color correction remaining when you use Transference while in Nyx’s Absorb with the Assimilate Augment equipped. • Fixed Baro Ki’Teer’s tutorial in the Relay not having subtitles. • Fixed capitalization discrepancies in the Foundry. • Fixed Lotus playing her ‘out of bounds’ extraction VO during every esophage warp in The Jordas Verdict. • Fixed being able to avoid Jordas’ Purge in stage 3 of The Jordas Verdict by Transferring to the Operator. • Fixed the Purge alarm activating well before it is ready to purge during stage 1 of The Jordas Verdict. • Fixed getting stuck as a burrowed Maw during The War Within quest. • Fixed constant pulsing of the crosshair from Mutalist Cernos and Pox DOT. • Fixed an issue where Nekros’ Noble Animation would play the Dual Pistol idle variant while holding a Rifle. • Fixed opening the Main Menu while in the Arcanes Menu opening the Main Menu in the background. • Fixed rounding in Equinox’s Pacify and Provoke HUD indicator (was truncating not rounding). • Fixed the End of Mission screen not displaying what weapon type of Riven Mod was received. 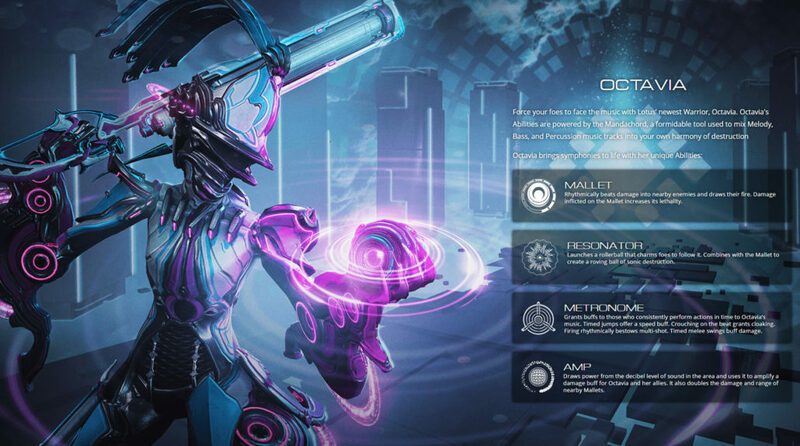 • Fixed numerous Warframe Augment Mods missing descriptions. • Fixed an issue with Warframe Auras not stacking in missions. • Fixed the bombs in stage 3 of Law of Retribution charging at a slower rate than intended. • Fixed aborting The Law of Retribution while carrying the bomb resulting in the bomb becoming bugged and stopping the mission progression. • Fixed the 2nd button in Jordas Verdict speed run tunnel has 2 lights that always remain green. • Fixed Clients being able to toggle off Rhino’s Iron Skin with Iron Shrapnel immediately after casting. • Fixed the Jupiter Junction task ‘Defeat a Prosecutor on Ceres’ not progressing if you killed a Prosecutor while they were blocking. • Fixed not receiving Junction rewards if the network connection disconnects and reconnects when activating the terminal. You can now replay the Junction and receive the intended rewards. • Fixed Infested Runners sliding or teleporting when dodging. • Fixed descriptions for Nightmare mutators appearing in info-popup when hovering over Quest nodes whose underlying node happens to be affected by Nightmare mode. • Fixed the Ogma clipping through the floor in the Codex diorama. • Fixed the Spira and Hikou holsters clipping through Nidus’ legs. • Fixed double listing for Attack Drones in the Codex. • Fixed a bug where non-Helios Sentinels could equip the Deconstructor when randomizing their loadout. • Fixed Sugatras not attaching properly to the Glaive Prime when equipped with the Conclave Skin. • Fixed a map hole exploit in Vay Hek’s boss fight. • Fixed explosive barrels in Vay Hek boss fight not showing proper effect for Clients. • Fixed players sometimes auto-failing the Mastery Rank 19 Test. • Fixed Mirage’s Prism ability stat screen showing the number of lasers increasing with Strength when that doesn’t actually happen. • Fixed inconsistencies in visibility/scale for the Helminth Cyst while Archwing is equipped. • Fixed a bug where one player going into Operator Mode is able to trigger boss fights, locking other squadmates out of the boss arena. • Fixed buttons in World State Window being focusable when they should be hidden. • Fixed several escapable map holes in the Corpus Ice tileset. • Fixed corners where NPCs could get stuck in the Grineer Galleon tileset. • Fixed HUD script error for Clients in Exterminate (and possibly other) missions. • Fixed finisher kills from Companions not counting towards Junction tasks and Challenges. • Fixed the Javlok disappearing after being thrown if you left the room. • Fixed enemies in unconscious ragdoll state not taking damage to the correct body part when you shoot them. • Fixed explosions and other radial damage sources not working inside Eximus shields. • Fixed Arctic Eximus Snow Globe blocking explosion damage that they should not be blocking (and not blocking it when it should have). The barrier should now be closer to the visual representation. • Fixed destroying the Grineer Shipyard Sabotage core with a Punchthrough weapon too early breaking mission progress. • Fixed instances of containers spawning in unreachable areas in the Grineer Settlement tileset. • Fixed being unable to pick up the Telemetry Keys in the Kuva Fortress Assault tileset. • Fixed the MK-1 Kunai and MK-1 Strun not being purchasable in the Market when completing Vor’s Prize. • Fixed numerous Syandanas not applying properly to the Valkyr Gersemi skin. • Fixed another case of being able to go through walls using Ivara’s Dashwire ability when running at low frame-rates. • Fixed not receiving the Vacuum Mod upon crafting Taxon. You should receive the Vacuum Mod upon relog! • Fixed an incorrect icon for Login Reward content. • Fixed multiple map holes in the Grineer Asteroid tileset. • Fixed Submersible transition spawn points appearing randomly in non-aquatic areas of the Grineer Sea Lab tileset. • Fixed Equinox changing forms when Focus is activated. • Fixed the Kuva Guardians Knockdown animation not playing for Clients. • Fixed deactivated underground Turrets in the Grineer Fortress being affected by abilities (Nyx’ Mind Control, etc) and causing a weird visual FX. • Fixed a script error caused by the Sibear. • Fixed a script error when entering research rooms in the Dojo. • Fixed a script error when playing Infested Salvage. • Fixed various localization errors. • Fixed a very common End of Mission crash. • Fixed a crash when entering text in certain languages. • Fixed a hitch when casting Chroma’s Effigy if you don’t have the default helmet equipped. • Fixed a mysterious room appearing in the Grineer Asteroid tileset. • Fixed the Euphona Prime doing no damage to ragdolled enemies. • Fixed file paths appearing for Helios Prime when crafting it in the Foundry. • Fixed Lephantis (and possibly other enemies) not attacking resulting in incompletable Assassination missions. • Fixed a script error when casting Trinity’s Blessing ability. • Fixed Banshee Sound Quake ability causing her Syandana to fly straight up. • Fixed Banshee Prime’s Helmet antennas flying straight up during her Sound Quake ability. • Fixed the objective marker for Rescue targets not appearing when outside of the Rescue room. • Fixed Clients unable to see Rescue marker on the mini-map. • Fixed Interception enemy markers not being red and having smaller icons. • Fixed Relic selection screen not being visible when selecting a Relic from the pause menu. • Fixed getting double End of Mission rewards by disconnecting and rejoining. • Fixed Mirage’s Eclipse HUD buff icon being removed and not re-added if you recast as Client. • Fixed being able to equip Deconstructor on a Sentinel that is not Helios. • Fixed objects (Datamass, etc) falling through the floor in the Grineer Shipyards tileset. • Fixed the Ambulas boss room waypoint marker pointing the wrong direction. • Fixed a section of weird AI navigation pathing in the Grineer Galleon tileset. • Fixed Kavat interaction sounds sometimes not playing. • Fixed Jackal boss fight being triggered by Operators. • Fixed Syandanas clipping through the Frost Harka skin. • Fixed positioning of the Quaro Armor on Ash’s Koga Skin. • Fixed an incorrect tileset object appearing in Pluto Spy Vaults. • Fixed an escapable hole in the Infested Ship tileset. • Fixed attempting to give the Rescue Target a weapon in Rifle/Melee-only Sorties would instead give everyone their secondary weapon. It’s quite thoughtful of them to attempt to return the favour, but the Tenno must politely decline. • Fixed loading into the default mission type when attempting to load into a variant on that node (Operation, Nightmare, etc) due to Clients loading in before the Host does. • Fixed Health Bar UI becoming broken after using Transference and performing a Void Dash. • Fixed FXs that rely on time sometimes running at half rate after pausing. • Fixed Frost’s Augment Mod not having a description. • Fixed a script error when accepting an Alliance invitation to an Alliance that no longer exists. • Fixed Ash’s Noble/Agile animations not functioning properly with the Javlok. • Fixed Equinox’s Noble/Agile animations not functioning properly with the Javlok. • Fixed the Ambulas’ transmissions not having sound. • Fixed NPCs being eaten by the ground when attempting to capture areas in Interception missions. • Fixed the Hyekka Master being able to hit Limbo in the Rift with her Ignis if there are other enemies around Limbo. • Fixed script error when equipping the default fur patterns for Kubrows. • Fixed some cosmetic previews in loadout not showing the correct cosmetic (ie. Lotus fur pattern for Kubrows when it’s the natural one). • Fixed Vauban’s Bastille and Vortex lingering in tiles after players have left said tile.This resulted in enemies continually being damaged or immobile even after the ability ended. • Fixed the HUD displaying the Shield/Health damage indicator when switching to/from Archwing Submersible and other scenarios where your Health percentage lowers without you actually taking damage. • Fixed the Extraction marker remaining on screen for Clients after a minute in Survival. • Fixed missing ‘Incoming Wave’ and ‘Wave Cleared’ messages in Defense missions. • Fixed Equinox (and possibly Chroma) appearing to have a full grown Cyst when in reality it’s not mature and ready for curing. • Fixed Quest info in Navigation and Sand of Inaros Vessel not properly updating when you cleared your active Quest through the Codex. • Fixed lingering Torid projectiles causing self-damage after Hall of Mirrors wears off. • Fixed being able to use Warframe Abilities in the Mastery Rank 3 test after a death occurred. • Fixed the Scorpion Eximus having an odd texture on her face. • Fixed Transferring to the Operator while in Hysteria breaking the ability FX. • Fixed Equinox’s Agile and Noble stance not applying when holding a Bow. • Fixed a script error that occurs during a Host migration in Survival missions. • Fixed the Corpus Ship announcer playing during final Archwing mission. • More fixes towards remaining cases of unreceived quest rewards dating back to November. • Fixed Clients not seeing gas traps in the Grineer Fortress Defense mission. • Fixed a script error in the Grineer Fortress Defense mission. • Fixed Adhesive Blast not causing the Javlok explosion to stick and pause for a while (through primary fire). • Fixed Inaros’ Devour drag FX not appearing for Clients. • Fixed rare crash when starting the game or opening the Arsenal. • Fixed the Coaction Drift Mod not fully applying when put into the Exilus slot as opposed to a non-Exilus slot. • Fixed the Physique Aura applying inconsistent Health values to each squadmate. • Fixed being able to stack speed buffs exponentially with Dispatch Overdrive and a toggled 4th Warframe ability (Excalibur, Valkyr, etc) . • Fixed being able to use Nezha’s Blazing Chakram to bypass nerves, doors, and barrier in The Jordas Verdict. • Fixed Auras being applied to Mirage’s Hall of Mirror clones. • Fixed Nyx’s Assimilate Augment not allowing teammates to charge you up by fire absorption. • Fixed Mesa’s Peacemaker ability not applying camera shake when firing. • Fixed Specters getting their Energy drained twice per tick (when using an ability that drains over time). • Fixed getting stuck in the Archwing Revive animation when attempting to revive someone. • Fixed the Javlok disappearing when being thrown into water. • Fixed Azima’s disc lingering forever which could result in a performance dip. • Fixed players standing in front of you and blocking your view of Maroo when talking to her. • Fixed the Javlok not having a firing animation when on a zipline and also not being able to throw it. • Fixed seeing multiple Operative health bars in Sortie Defense. • Fixed Mesa Specter’s not being able to cast Shatter Shield. • Fixed previewing quest keys not showing their dioramas. • Fixed some quest key items missing descriptions. • Fixed Sugatras being incorrectly positioned on numerous weapons. • Fixe the Akstiletto Conclave Skin clip shifting to the wrong spot. • Fixed headshots and kill-shot sounds not playing properly. • Fixed missing pickup sounds for the Javlok. • Fixed numerous TennoGen Syandanas clipping through Warframes. • Fixed Limbo’s Noble stance Bow idle using the wrong animation. • Fixed more items not able to be Chat linked. • Fixed the Patient Zero quest Mesa Specter holding a random purple object. • Fixed Frost’s Snow Globe ability radius stating the incorrect value in the Arsenal. • Fixed format cost for when “increasing Way capacity by 1” to have a comma, and made Focus names Title Case when in “commit Focus changes” prompt instead of UPPERCASE. • Fixed inconsistent capitalization on enemy names in the Simulacrum. • Fixed cases of incorrect localized text. The Pacifism Defect update has been sent to Cert! If you are in a competitive Clan: The moment the Operation begins, your Clan Roster is locked in. Clan membership changes that occur after the Start of the Operation will not be reflected in the Leaderboards. If you wish to readjust your membership, do so before the Operation begins! We’ll update this thread with new information as we receive it. 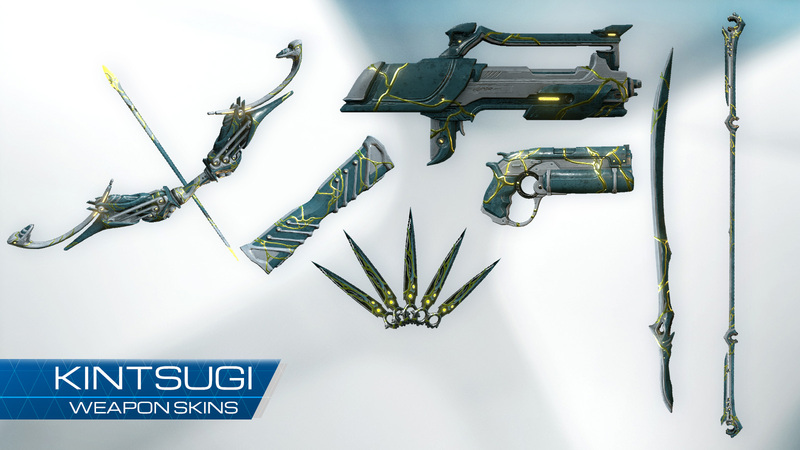 Customize your Warframe, Weapons, and Landing Craft, and ride in style this Saint Patrick’s Day! The Shamrock Color Picker is available for only one Credit now until March 20 at 2 p.m. ET. Go to the Market and get yours today! Head out on a mission in your festive Landing Craft, and feel the Luck of the Lotus! This year’s PAX East Panel was jam-packed with exciting reveals and some unfortunate technical difficulties – if you couldn’t make it to PAX East in time to join the Devs live, we’ve outlined them all below. You can watch the Unofficial Stream here. It’s here, it’s finally here! A huge thank you for our team for working so hard to ensure that Valkyr Prime got her chance in the Ballas-narrated spotlight. Warframe Web Comic: Coming Soon! We are excited to announce our partnership with Caravan Studio! The Next Major Update will be released with its very own web comic. Be sure to keep an eye on our social media for more details leading up to our next major update! But wait – we have another amazing collaboration to announce! 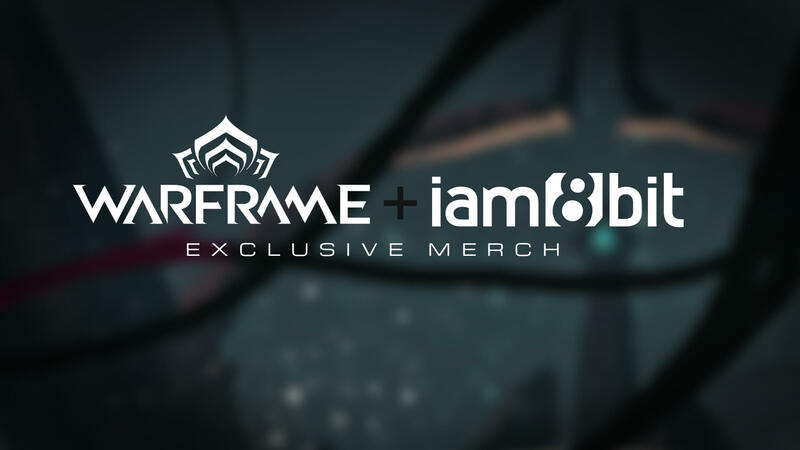 We’re partnering with the brilliant minds at iam8bit to bring you original and exclusive Warframe merchandise. A full reveal of the collection will come later this week. 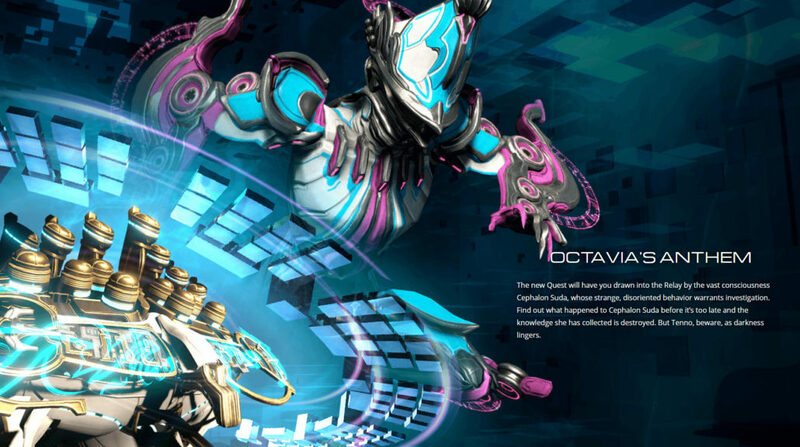 Soon Tenno will meet OCTAVIA! The Design Council submitted Octavia as a possible name, and we’ve decided it’s perfect for our Musical entry into your Arsenal soon!